Today I Found Out the “Hip Hip” in “Hip Hip, Hooray” was once anti-Semitic. This phrase is thought to have its origins in the middle-age Latin battle-cry “Hieroslyma est perdita’, which means “Jerusalem is fallen” or “Jerusalem is lost”. This was later shortened by Germanic tribes fighting Jews to “Hep Hep Hu-raj”, meaning loosely “Jerusalem is fallen and we are on the way to paradise.” This also found its way into a Hungarian battle cry “Huj Huj Hajrá”, which more or less just meant “faster, faster”. An alternative theory is that it comes from a Germanic shepherds cry or a hunter’s cry “hep hep”, which was used to rally their trained dogs. It is also possible that this shepherds cry was not the origin, but rather itself was from the proposed Germanic battle cry “Hep Hep Huraj”. I am infinitely sad on account of the Jews, in a way I have never experienced before… What should this mass of people do, driven out of their homes? They want to keep them only to despise and torture them further… I know my country. Unfortunately. For the past three years I’ve said the Jews will be attacked. I have witnesses. The Germans wax bold with indignation, and why? Because they are the most civilized, peace-loving, and obedient people… Their newfound hypocritical love for Christianity (may God forgive my sin) and the Middle Ages, with its poetry, art, and atrocities, incites the people to commit the only atrocity they may still be provoked to: attacking the Jews!… Their hate does not stem from religious zeal: how can they hate other faiths when they don’t even love their own? At some point after these Hep Hep Riots, it’s not entirely known when, this now anti-Semitic rallying cry of “hep hep” became “hip hip” and the response cry of “hooray” became traditional. In English “hep” means “aware, up-to-date”, with the first recorded usage as an English word in a 1908 Saturday Evening Post article. The variant of “hep”, “hip” as meaning “informed”, also first appeared in English in the early 20th century and is more or less what “hep” meant as well in English; so it is possible the two words simply diverged due to accents of those speaking the word, which then made its way into print with different middle letters. The exact origins of “hooray” are also just as mysterious as “hep hep”. Some think it came from the 17th century sailor’s cheer, “huzzah”, which itself has unknown origins. Other’s think it’s from a Mongolian exclamation of a similar sound, which is meant to be a cry of bravado. Others think it is from the 10th century Hungarian “Hajrá”, as in the above “Huj Huj Hajrá”, which itself might be from the Germanic “Hep Hep Hu-raj”. 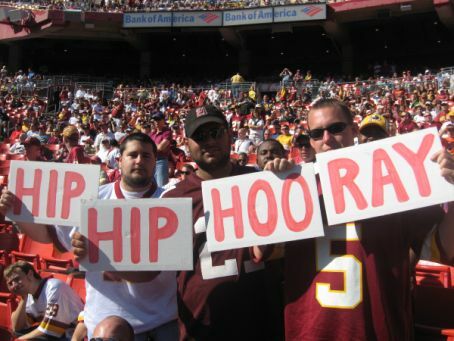 “Hip Hip Hooray” was originally introduced to the Redskins American Football team by George Allen in the early 1970s. It was later unintentionally re-introduced by rookie head coach Jim Zorn, who initiated the cry after the Redskins pulled a major upset over the Dallas Cowboys; he did this mimicking something he learned from former head coach of the Seattle Seahawks, Chuck Knox, who used to do it in the late 1970s. When the Redskins won again the next week, the players initiated the cry this time. This has since caught on and become somewhat of a tradition among Redskin fans and players. speaking of romans and religion, it was about 100ad that romans started using a term for a recent jewish sect: “christian”. it caught on. “impressionism” is another term invented by critics of that style of painting. The whole thing sounds like a preposterous folk-etymology. Jerusalem my eye. This all strikes me as pretty unlikely, and very poorly sourced at that. Next you can do the etymology of ‘San Diego’, as determined by Ron Burgundy. @Daven Yes that’s precisely what he was saying. Go hunt for witches elsewhere. May you laugh with lizards you devil! Everything is anti-Semitic if you ask the kikes! The holohoax is the biggest lie of the 20th century, but the world would be better off if millions of kikes were exterminated. @walt235: wow, just wow… This one’s for you. Today I found out if you look hard enough for something, you’ll likely find it. How you think hip hip is anti-Semitic is odd as the Jews never ruled or held Jerusalem in the middle ages. Both Muslims and Christians ruled the city formally known as the capital of Kingdom of Jerusalem during that time period. All though Jews were known to be among the most vigorous defenders of Jerusalem against the Crusaders, when the city fell, the Crusaders placed all the Jews in Jerusalem inside the city’s synagogue and then burned it down. In fact at times Jews were forbidden to even enter the city. But to my knowledge the Jews never held the city in the middle ages. So to say the hip hip in hip hip hooray is anti Semitic doesn’t ring true to me at least in my humble opinion. I’m not even a interested in the article (maybe cause i already knew this) as I am interested in the comments. The holocaust never happened? Do the US military didn’t rescue them? Hitler never held speeches? My family was never in concentration camps? @crystal I’m pretty sure it wasn’t just the US military who rescued the Jews. I take it you’re american? @shane I’m pretty sure Crystal didn’t say it was only US military, you are putting words in her mouth. I take it you’re anti-American? I was struck by the similarity of the first Arabic word here to English hoorah.